The Dambulla Cave Temple is also known as Golden Temple of Dambulla. It was built in the first century BCE with 220 years of history. The temple sits on a 160m-tall mountain, under a vast overhanging rock. It is carved with a drip line to keep the interiors dry. 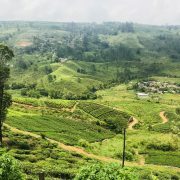 This is another UNESCO World Heritage site in Sri Lanka. It is the largest and best-preserved cave temple complex in Sri Lanka. There are public buses going to Dumbulla from Kandy Central Bus Station every 30 minutes. The price for public bus is Rs 200 (~US$1.10) per person and the journey takes around 2.5-3 hours. The public buses are non-air conditioned. There are express buses and non-express buses, all buses travel by the same route, non-express buses have more stops. The bus will stop at Dambulla, you will have to take a tuk tuk to Dambulla Cave Temple which should costs you around Rs 200 (~US1.10). There are also air-conditioned minivans which costs Rs 400 (~US$2.20) per person. The route taken and journey time is the same as public bus, except you will be travelling with a smaller group of people. This is the most comfortable and most expensive option. The car or taxi will drop you off right in front of Dambulla Cave Temple. The journey will take around 2 hours and it will cost around Rs 8000 (~US$44) per person. It is not advisable to travel by tuk tuk for such a long journey which is 2.5-4 hours depending on road conditions. The price is around the same as a private car or taxi at Rs 7500 – 8000 (~US$4.10-4.40) but there is no air-conditioning. The Dambulla Cave Temple’s opening hours is 7am – 7pm but the ticket counter closes at 5pm. The admission ticket is Rs 1500 (~US$8.20) per person. The ticket counter is located at the base of the hill. You will have to climb around 10 minutes up the hill to reach the cave temples. You are entering religious grounds, so please dress appropriately. Make sure that your shoulders and knees are covered and remove any hats. You will need to remove your shoes before entering, the shoe rack in front of the entrance charges Rs 25 for every pair of shoes. You can also leave your shoes elsewhere, but I would rather pay the small amount than go through the ordeal of losing my shoes. The stone floor becomes very hot after being baked in the sun for hours, do remember to bring a pair of socks to protect your feet. Dambulla Cave Temple is made up of five caves. The five caves houses a total of 153 Buddha statues, 3 statues of Sri Lanka kings and 4 statues of gods and goddesses. Theses paintings and stairs are all related to Gautama Buddha and his life. Wikipedia has detailed descriptions of the statues and paintings in the five caves. This old Sri Lanka man in white robe is sitted in a corner. He will bless a strand of twisted white thread and tie it around your wrist for a donation of any amount. It is actually an amulet, a nice little sourvenir from Dambulla Cave Temple. Slightly lower down the hill is the Golden Temple with the world’s largest Buddha statue. The 30m-tall Buddha statue features the Buddha in dhamma chakka posture. The Golden Temple also houses a Buddhist museum. Buddhist devotees have been making pilgrimages to Dumbulla Cave Temple for centuries. If you are a Buddhist, you will probably want to visit this place. Even if you are not a Buddhist, the beautiful paintings and statues are still worth the a visit. The serenity of the place will give you some much-needed peace.